What happens when we die? What an old question and in truth, each of us probably have a different world-view. For some there is reincarnation, for others, there is a soul that goes to one place or another. Others still may have a nihilistic view that we dissolve back into the source from whence we came. In my view, there is God or Source. From this source is the emanation of life. This can be conceptualized as a ray of light. Think of a child’s drawing of the sun. There’s a yellow circle with lines reaching out from it. We, like those lines (rays), are extensions of the Divine source. At one point (closest to source) we have a “higher self,” which would be our highest spiritual ideal. The nearly enlightened being. At the other end of the ray of light, it would dissolve into various frequencies unseen – this being the furthest from God/Source that we can go. If you can conceptualize this diagram of the sun and a ray of light… consider that there’s an infinite amount of rays, and each ray is a sentient soul or consciousness. 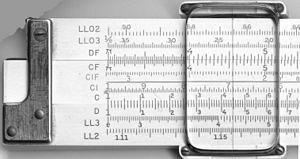 Now visualize that old slide ruler. Look at the example here to the left. In this image, we have v arious markings of measurement, and there’s a slider that moves along the ruler. This slider is like one’s own consciousness – or awareness. Where this resides, is where our experience occurs. If one had the awareness of a harsh and cruel world where only might makes right, well that’s the awareness they hold along their soul (that ray of Light from God.) What if that awareness shifts? Then their world-view shifts. Awareness always shifts at death, or so I believe. In that moment, you are no longer the physical body and one’s level of consciousness will adjust to something new. It might be a shift into a new incarnation, a spiritual body, etc. This belief is based on Eastern world-views. Life changes can also cause one’s awareness to shift. Having a near-death-experience can cause this. Hitting rock bottom and finding a new spiritual path, can cause this. Meditation and spiritual work will shift this as well. Within Tibetan Buddhism, there is a concept of Emptiness (the lack of self-existence.) When directly perceived (via one’s path towards enlightenment), one can see all things as they truly are (outside of karma) and can shift into a new experience. If we are a ray of one light, do we reincarnate or remain an eternal soul? Why not both? The ray of one light is eternal. It embodies each of our incarnations, and yet it’s where our awareness currently resides. If a psychic medium were to tap into an old past life of yours, it would be alive and communicate to them, and yet, here you are in physical form. The “you” of “now” is simply where your awareness appears to be focused on your enteral life. While the extension of our life has gone on for millions of years. Within each past life, there is a personality. The conceptualized ray that you embody is simply holding the entire experience. What’s more important, in my view, is moving fowrad spiritually into Nirvana and Enlightenment. The idea of Nirvana is the goal of Theravadin Buddhists. It is a state of bliss that takes one out of the suffering nature of life. Yet, it is limited in scope. It is not enlightenment. In this analogy of a “ray of one light,” Nirvana would be akin to fully realizing your own ray. It would be the self-awareness of knowing your entire eternal scope. You would no longer be held to the suffering nature of the world. You would know your higher self and all other states, as well as your past and future selves. One would be at the point of connection with the Divine source. Through this analogy of the “ray of one light,” one might ask, “well what is enlightenment?” Enlightenment is not just knowing your own “ray” as it were. Enlightenment would be the understanding of all rays (all expressions of God – all life.) You would know each person’s totality, as well as their potential changes. You would see their highest and lowest forms, and each incarnation they have had and will have. It would be clear to the enlightened one how best to help each sentient being. To that, I answer that the word is not an English invention, it goes back to the Buddha himself. To become enlightened is to become the Buddha (the path of all Mahayana Buddhists.) Buddha nature is very specific in scope of power and capability. Simply put, a Buddha see’s Emptiness directly. They know how best to interact with an individual, as they see all multi-dimensional aspects of a being at the same time. Without getting into the depths of emptiness, it should at least be discussed to understand the scope of a Buddha. “Self-existence,” is how most people relate to their world. Most of us label things. We say, “that’s a pencil,” or “that’s a bad man,” “over there is a good man.” These are concepts of self-existence. Buddhism disagrees. In the Buddhist world-view, there is no “pencil.” There is no “good man.” We only see these things as the labels we define them by because our karma causes us to perceive it that way. According to Buddhism, if you had the karma to see yourself happy – you would be happy… and if you had the karma to see a pencil as a weapon, then it would be that way. A dog, for example, does not see the pencil the same way you or I do. A killer may see a weapon, instead of a pencil. The “good man,” might be seen by others as a charlatan. The “bad man,” might be viewed by others as “good.” It all relates to one’s karma. Karma paints the emptiness (the empty objects) in specific ways. There’s an old story in Buddhism to illustrate the idea of Emptiness. It talks about a glass of fluid, resting on a table. Three beings look at it. The first is a Holy Being, and it see’s a glass of Divine nectar. The second is a human, who perceives a glass of water. The third being is a hellbound man, and he see’s a glass of blood and puss. There is only one glass of fluid, but each perceives a different coloring of their reality. For one, they have the karma to see a world of violence, and another to see a world of peace. The solace in this philosophy is that by changing one’s karma, we change the world. Bringing this back to the core idea: each of us see things in a limited fashion. But we are all on the path of enlightenment. In time, we will reach our goal. When we do, we will not need to garner attention, money, or have cravings. All unnecessary things will subside and we would see truth. Our existence is multi-dimensional. In one way, we are like a ray – from the Divine source. We radiate out from a near perfect state (higher self) to that of complete lack of light (lower self.) Our awareness is what holds us to a specific point in this range of spiritual degree. Through incarnations, we carry over karma, which paints individual reality… and via the help of spiritual beings (enlightened beings) we are able to grow. An enlightened being see’s each sentient being’s multi-dimensional aspect of nature… Knowing how best to help, the enlightened being, helps a person through their own karmic hardening. Example: If you see a world of violence, an enlightened being could put specific growth mechanisms within your path. To know oneself, is to reach a higher state along your path. It is to know your individual ray… where you come from, where you are going. It is not just conceptual knowledge, but a real experience. You have direct perception of your state of existence, now and historic. Some may call this “nirvana,” but we could say it’s an initial state of awakening. It is not, however, enlightenment. The enlightened being, is fully awake. They not only realize their own ray of light (self-realization), but each sentient being’s rays as well. They seel the lack of self-existence in all beings and know how best to aid them in their current growth and path.